Brandon Gregg, who has severe, treatment-resistant depression, sits in a chair at Stanford University, where he has received two rounds of accelerated transcranial magnetic stimulation therapy. Photo by Veronica Weber. Nolan Williams, center, and Keith Sudheimer, far right, stand in a lab used for transcranial magnetic stimulation (TMS) research with Brandon Gregg, far left, a participant in their accelerated TMS study. Photo by Veronica Weber. For the last 40 years, Brandon Gregg has lived a "half life." Gregg, a 69-year-old Burlingame resident, has major depression. He's constantly tired, easily irritated and unable to complete even simple household tasks. His depression made working near impossible as his symptoms worsened and engaging with others became increasingly difficult. He eventually decided to manage investments from his home and also withdrew from personal relationships. His psychiatric disorder manifests in physical ways, too: persistent headaches, back pain, upset stomach, diarrhea, difficulty sleeping. Gregg's mood disorder has resisted treatment of all kinds: He has tried more than 30 different kinds of antidepressant medications, electroconvulsive therapy, ketamine (a narcotic) therapy, a surgically implanted nerve stimulator in the region of the brain out of which depressive symptoms arise, participation in more than 15 clinical trials and more than 100 rounds of transcranial magnetic stimulation (TMS) therapy, a noninvasive procedure that uses magnetic fields to send signals to that same region of the brain. Earlier this year, he was scheduled to take a more experimental, invasive and expensive step: deep brain surgery. In a twist of fate, that brain-surgery trial at Stanford University closed early. Jessica Hawkins, a clinical-research manager at the university's Depression Research Clinic, connected Gregg with Nolan Williams, a Stanford psychiatrist and neurologist conducting a unique study on transcranial magnetic stimulation therapy. Williams also directs Stanford's Brain Stimulation Laboratory. Instead of the traditional version of TMS therapy that Gregg had received previously, Williams is studying how accelerating the pace of TMS — treating patients over several days rather than several weeks — would affect their symptoms. By day five, for the first time in several decades, Gregg no longer met any clinical criteria for depression. His condition was considered remitted. "After the first course of treatments was over, I felt so alive," said Gregg, a soft-spoken man with an intimate knowledge of the technical terms and research surrounding his mood disorder. "I was doing all of these things that I hadn't been able to do for a long time. It was like nirvana." Gregg said he was "a typical stoic, hard-working, don't-admit-it-hurts, type of person" who did not recognize early signs of depression in himself in the 1970s. He said he received his first depression diagnosis in the late 1970s or early 1980s. He has since turned to nearly everything for relief and to stay connected to the world: research, medical studies, clinical trials, support groups, national conferences, volunteering, supplements, yoga, meditation, even dance classes and serving on local boards and commissions. Williams and his research partner, Stanford psychiatry instructor Keith Sudheimer, said they are the only people in the world studying accelerated TMS therapy with this particular pattern of stimulation. Initially positive results suggest they are at the forefront of an entire new field with implications for the treatment not only of depression but other mood disorders and neurological diseases like Parkinson's. There are about five people in the world — in Florida, Dartmouth College, Canada, Australia and Belgium — conducting similar TMS research, Williams said. Of 13 patients Williams and Sudheimer have treated so far, 11 have remitted. The two who didn't included a woman who came one point short of being formally considered remitted and a man who realized his primary diagnosis was not depression. For most, the relief lasted for about four months and in Gregg, whose depression is more severe, about seven to 10 days. "The really positive thing about this work is that a lot of the field of psychiatry has given up on the idea that there's a switch that we can throw somewhere in the brain that would have a dramatic improvement" on severe depression, Sudheimer said. "Here, we're showing there might in fact be something like a switch that we can throw if we just know how to speak the brain's language." TMS has only been tested on and FDA approved for people with clinical depression. People who have been diagnosed with clinical depression, or major depressive order, meet a certain level of criteria that others experiencing transient sadness would not. In TMS, thousands of magnetic pulses are sent into the brain to strengthen the signals between the subgenual cingulate and the dorsolateral prefrontal cortex, an area in the prefrontal region of the brain that oversees executive functioning and control — less in the psychological sense of controlling something with your thoughts and actions, but it exerts control over the subgenual cingulate, Sudheimer said. It's also the area of the brain that's stimulated during effective psychotherapy, Williams said. "We're mimicking this learning signal in the brain," Sudheimer said. "We're essentially saying 'Brain, learn a new connection,' and we do that over and over again." Gregg said he envisions it as "blasting a hole through a mountain, and it's got to keep going until finally you see full daylight." In the accelerated version, patients receive about 18,000 pulses over 10 hours per day, compared to 3,000 a day in traditional TMS therapy. In the Stanford study, the treatment stretches over five consecutive days. The device produces a rapid clicking sound and patients feel a tapping sensation. Unlike many options for people with severe depression, TMS therapy is a non-invasive, outpatient procedure with low risk and little to no side effects. Patients can drive themselves to and from and are awake during the procedure. About one in 30,000 people who have been exposed to traditional TMS therapy have a short seizure, and no one in the Stanford study has, according to Williams. There also appears to be no cognitive risk or harm associated with TMS — and in fact, traditional TMS leads to cognitive improvements, Williams said. According to NeuroStar, the first company to get FDA approval to administer TMS, the most common side effect is "transient" "pain or discomfort at or near the treatment site" that goes away for most patients after the first week of treatment. The "safety and effectiveness" of NeuroStar's therapy, however, has not been established for certain groups, including patients younger than 22 years old or older than 70 years old; those who have a suicide plan or have recently attempted suicide; and those who have a history of substance abuse, obsessive compulsive disorder, or post-traumatic stress disorder, among others, according to the company. The longer-term effects of exposure to the magnetic fields remain unknown, according to NeuroStar, but evidence indicates they do not pose any significant risk. Gregg said he has experienced no negative side effects — save a debilitating "crash" when the week or so of post-treatment relief subsides. "The crash, when they (the depressive symptoms) all reappear, is a very difficult time to try and live," he wrote in a follow-up email to the Weekly. "I felt like I had been whipsawed and been plunged into my deepest depression. "However, that short period of freedom, of not hurting constantly, of feeling like a member of society once again, of just smiling and looking forward to the day instead of dreading how I would somehow get through until I could fall asleep, was pure heaven — literally going from physical and emotional darkness and breaking into the sunshine of a new and better day." Though the accelerated version of TMS is new, the therapy itself is not radical. Developed in the late 1980s, Stanford has offered it clinically to patients since the late 1990s, Williams said. In 1985, British physician Anthony Barker developed a device that, when placed on a patient's spinal cord, would cause his or her thumb to move. He "got brave," Williams said, and asked: Why can't we do the same in the brain? Over the next decade, this was studied further by different groups, as information about depression and its causes also progressed. 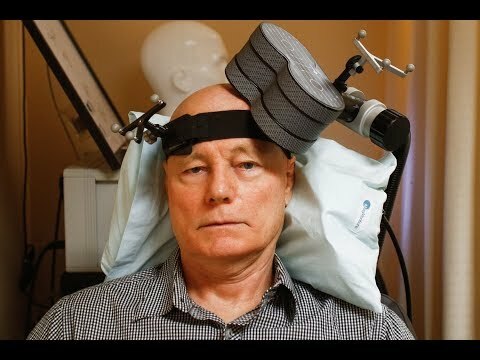 Mark George, a Medical University of South Carolina neuropsychologist who would later become Williams' mentor, saw a TMS device in action as a resident in London during this time and went on to co-chair a multi-site clinical trial of TMS sponsored by the National Institutes of Health. A chronically depressed patient, for whom no treatment had worked previously, responded to TMS, Williams said. They published their work in 1995. "Between 1995 and 2008, 2009 the first generation of TMS was born — a proven treatment for depression," Williams said. In 2008, the federal Food and Drug Administration (FDA) approved TMS as a treatment for people with major depression who have failed to respond to at least one antidepressant. Today, there are five device companies that have Federal Drug Administration approval for administering traditional TMS. Insurance will cover the treatment after patients have tried and failed four medications, Williams said. Despite this, only about 6 percent of people in the country who would be eligible for TMS get the treatment, he said. Although it's not a radical treatment, it's still "outside of the normal" training paradigm for psychiatrists, so patients don't get referred as often, he said. Williams does traditional TMS treatment at Stanford about once a week. (TMS also is offered at at least two private clinics in Palo Alto.) Patients come in for about 40 minutes once a day, five days a week for about four to six weeks. About a third of people receiving the traditional treatment remit, Williams said. About two years ago, he and Sudheimer teamed up to answer the question, "Why is it only a third and how can we do this better?" Williams said. The prospect of a compressed treatment was appealing to his TMS patients, who are considered on the severe end of depression. These patients are not "trivially depressed," Williams said. "These are profoundly depressed people." Instead of waiting six weeks for results and losing that time from their day-to-day life, including their jobs, they could come in for five full days of treatment and in theory, start to feel better sooner. The traditional schedule can be challenging, Williams said, given it can take a longer stretch of time to feel better. "In a six-week course, someone could go from having a job to losing a job, and we've seen that." They started testing the accelerated version iteratively, upping the duration and number of pulses per day until they matched what a patient would receive during a traditional TMS treatment. "We found (in) the first couple of people these dramatic, fast responses that one would expect to see after six weeks," he said. The demeanor of patients who were previously "sluggish," withdrawn and reluctant to engage with people when they came in for the treatment before changed drastically, Sudheimer said. "They're walking around, gesturing, speaking with people that they weren't (speaking to) before, (having) whole social interactions with me where they wouldn't have before," Sudheimer said. "Their movements look like a healthy person's." They kept some of the patients on their medications, even if they had been ineffective, in the hopes that they might prolong any positive effects. Psychotherapy may also be critical in maintaining progress, Williams said. Given the severity of Gregg's depression, Williams almost didn't treat him. He simply didn't think it would work and didn't want to waste Gregg's time — an attitude he described as his "naïveté ... because we hadn't pushed the envelope to really try to treat people at his level of severity." But it worked. Gregg said he "just started to feel better, kind of as if the load on my shoulders was getting lighter and lighter" — an understatement for someone who felt like he had been living a "half life" for decades. Even his physical symptoms improved. "It's like a magic wand just taking care of all these various things that had bothered me, some of which I never really knew and don't know whether they're connected with my mood disorder," he said. As soon as they saw Gregg's results, Williams called his mentor, Mark George. George advised him: "Do it again," Williams said. Gregg went through another round of treatment and remitted for about two days longer than the first time, Williams said. Both Williams and Sudheimer, who described themselves as "young upstarts" within the psychiatry department, competing for funding and resources, recognize that they're at the early stages, and more will need to be done to prove the accelerated therapy's benefits. "There's this common refrain in science and especially in depression work that you'll find what you think is a new treatment and it's almost like a cliche for people to respond this way: They'll listen to you very politely and then say, 'It's a miracle! Show it to me again — and then show it me again and show it to me again,'" Sudheimer said. "It only counts if you can repeat it over and over again and it works for everybody." Williams and Sudheimer are working to set up a blind outpatient study as well as a larger, inpatient version. One of their dreams is to offer accelerated TMS therapy to people who come to emergency rooms in psychiatric crisis, Williams said, to help them get back to daily life more quickly. "If we can produce months-long improvements for folks like Brandon, then we'd have something very important for folks at his severity level and anybody below that — and anybody above it," Williams said. "If that's true ... then that could be a breakthrough." If proven, the accelerated therapy has broad-reaching applications, the researchers said. Traditional TMS has already been shown in some cases to reduce schizophrenic hallucinations, to treat mania and to effectively treat post-surgery pain, they said. "This isn't just a depression treatment," Williams said. "You could imagine other areas where normal TMS is being explored like addiction, neurodegenerative conditions, OCD (obsessive compulsive disorder) ... and modify the method to the condition." Before Gregg became self-employed, he worked in and owned businesses in a range of fields: auditing, accounting, tax, insurance, property management, investment brokerage and real estate — worlds he cut ties with years ago as his mood disorder worsened. He's now awaiting his next round of treatment in November, eager for the ability to return to activities he has mostly been without for decades. "I look at depression as living a half life," he said. "I'm looking forward to becoming a whole person. I have things that I still want to do in my life, books I want to read, books I want to write. "I'm really looking forward to a life that is not inhibited by my mood disorder, and therefore, my mood disorder will not describe me anymore," Gregg said. Watch the Stanford researchers and Gregg discuss the TMS therapy research in a video here. Thank you, Elena, for this article. The local mental health community has been following Dr Williams work with such hope. He speaks about treating depression just like other doctors speak about treating other chronic illnesses. And anyone who loves someone who has any chronic illness knows how miraculous it would be to have a treatment that could offer periods of remission (or even a cure). Dr Williams work could literally change how mental illness is viewed and treated. Thank you to Stanford and Dr Williams and his colleagues for this amazing work! Is Gregg still undergoing this treatment and is he improving each time? The article leaves me wondering as it only mentions two times the treatment was used on him. How is he now? I did TMS almost 2 years ago and it ruined my life. It took me from a functioning person who had depression to extreme depression and pain. I stopped at 20th session as i could not sleep at all. Ativan which always worked to help me to sleep on an occaional night didn't work. .I thought my life was over. Now it's 2 years later, i've gain 55lbs, I m on disability, I'm in pain every day. i can't function. I was not like this before TMS. This year i've been on all sorts of meds with horrific side effect. My life has been ruined by this treatment. You hear all the positives. But i'm telling you this is dangerous stuff ,playing around with the brain. I'm lost what to do and the suffering is unreal. I wasn't on any meds for 2 years and during TMS. There was a very interesting Japanese video series called the "Origins Of Disease"
and competition it forces on people that causes social alienation and depression. or twist their brains around seem disgusting to me, and reminiscent of lobotomy.